I really don't want to miss out on all of my 'normal' posts this week while taking part in KCBW so here's a very quick update for WIP Wednesday and the Yarn Along. This week I've mostly been working on the Knitalong shawl. Running low on the contrast colour, I finished with that after the 11th stripe and am now onto the border. Unfortunately the rows are getting long - probably close to 400 stitches. It's quite laborious as it feels as though there's not much progress at all - but it will be worth it when it's finished, as it feels completely gorgeous. To break up the boredom I cast on a test knit for Joanne at Not So Granny last week and have done a little work on that but I'm trying not to let it distract me from the shawl. I'm delighted to be back to The Farseer Trilogy with part 2 - Royal Assassin after spending a few days reading the book club book I mentioned last week (I was right, not my kind of book at all and I didn't really enjoy it but finished it ready for the group discussion). You know I *almost* did it too - but I counted to 50, realised it wasn't that far across the needle and gave up! re: books i'd recommend anything by maggie o'farrell. she's my absolute fave, and i imagine her books would be great for book club discussions too. how to talk to a widower by jonathan tropper is another absolutely wonderful book i think you might enjoy (maybe you've already read it?). and of course, the book that i keep recommending to *everybody* ever since i read it - a kind of intimacy by jenn ashworth. fab, fab, fab!! Thanks for the book recs, I'm off to look on your blog ! It amazes me how you can read and knit at the same time! You are so multi-talented. I need to do an update a-long post. I've reached the penultimate contrast stripe! The shawl is looking lovely! I don't know enough about book clubs to make a suggestion :). You are so good! I skipped my yarn along this week as I didn't have time to blog twice today but I admire your commitment. Great color choices for your shawl KAL. Well you know I like to keep a track of my progress as much as I love to keep up with the other people in the link-ups so I didn't want to miss it. I completely missed my SSSKAL and WIP posts, mainly due to being in all day meetings at work - I barely managed to get my KCBW post up! I'm still on stripe 11 (again, too many meetings and late nights for work!) and obsessively weighing my yarn to see if I'll have enough for stripe 12 or will go with your plan of doing a larger border! I need a small scale to weigh yarn - that would help me a lot - I only have an old kitchen scale and it's not digital or sensitive enough to show a few grams difference. I may need to go shopping! 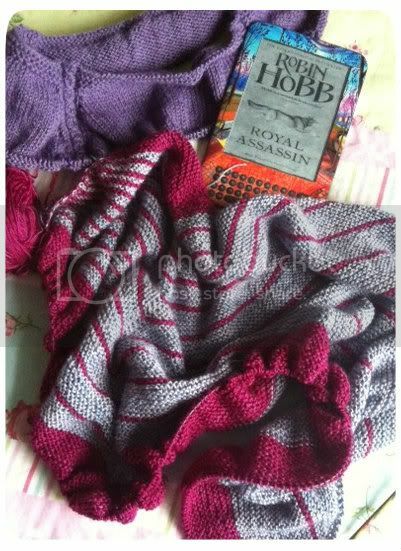 I love stash-busting projects, and your shawl is gorgeous! Thanks for posting on my site so that I now know you are out there. I love knitting and books, so I'm looking forward to getting to know you! Beautiful knitting!! I just had to say, I LOVE the Farseer Trilogy (and the next one, the Tawny Man trilogy...I think it's called). Good stuff!! Enjoy! I really like your striped study shawl. I just swung by Ravelry and faved it. I really like the colors you choose.